Sometimes the best marketing is done right in your neighborhood! 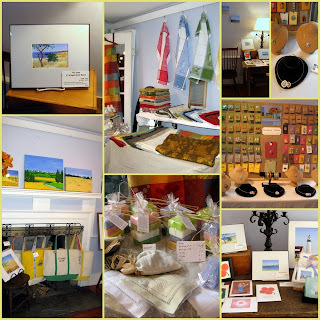 A great way to showcase your work is by organizing a trunk show at a local retail establishment. Scope out the gift shops in town. And don't forget restaurants, cafes and even flower shops! Many would welcome the increased foot traffic a trunk show brings. Approach them with your idea. If you have additional artisans lined up, even better. Expect to pay a fee - either a percentage of your sales or a flat fee. But sometimes even this is negotiable and may even be free! 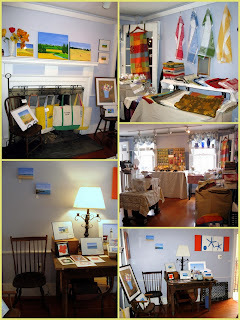 I recently organized a trunk show at our neighborhood vintage and gift shop, the Joy of Old. The shop is charming - dating back to 1805, it has a ton of character and is just a block from Boston's Freedom Trail. The owner was super cool - she agreed to host a trunk show in exchange for cleaning up and organizing her badly cluttered back room. What a deal! I lined up Nancy Wovers of French Merchants, who sells soaps and linens from France made in traditional ways, and fellow artist and neighbor, Sophie Lowery. We spent a couple of hours setting up, and the back room of the Joy of Old never looked better. We sent a press release about the event to the local Charlestown newspaper and to various community groups and associations, e-mailed our own clients and distributed posters around town. All in all, we had a pretty good turnout, made some sales, and the shop owner was thrilled with all the additional foot traffic, many who had never been to the shop before!